28.11 MINOR COUNTRY RESISTANCE LEVELS: Minor country resistance levels are a component of the declaration of war threshold that must be met for the Allies to declare war in support of a minor country (32). A. The basic defensive strength of the target minor country (28.2). B. The current diplomatic alignment of the target minor country (28.3). C. The diplomatic alignment of countries bordering the target minor country (28.4). D. A random tile draw that increases the minor country’s resistance by one, two or three (28.5). 28.13 ETHIOPIA’S RESISTANCE LEVEL FIXED: Ethiopia’s resistance level is equal to its basic defensive strength of one (28.21A). Ethiopia’s resistance level is not increased by the 28.3 to 28.5 modifiers that apply to other minor countries; diplomacy is not permitted in Ethiopia, it has no bordering countries and no random tile draw is made for Ethiopian resistance. G. Czechoslovakia: 4 (-2 if the Sudetenland is being demanded or if the Sudetenland is German). H. Poland: 6 (-2 if Danzig and the Corridor are being demanded or if Danzig and the Corridor are German). A. The resistance level of the target is decreased by one if the Axis have one or two flags in the target. B. The resistance level of the target is decreased by two if the Axis have three or four flags in the target. A. The resistance level of the target is increased by one if the Allies have one or two flags in the target. B. The resistance level of the target is increased by two if the Allies have three or four flags in the target. A. If the Nazi-Soviet Pact has not been signed, Russian flags, including those co-existing with Allied flags, are treated as Allied flags. B. If the Nazi-Soviet Pact has been signed, minor countries containing Russian flags may not be the target of Axis aggression (27.21C). A. AXIS TRADE PACTS: The resistance level of the target is decreased by -1 for each Axis trade pact in a bordering country. B. ALLIED TRADE PACTS: The resistance level of the target is increased by +1 for each Allied trade pact in a bordering country. If the total number of Allied and Russian flags in a bordering country is three or more, the Allies are considered to have a trade pact in that bordering country for resistance level determination purposes only. If the Nazi-Soviet Pact has not been signed, the resistance level of the target is increased by +1 for each Russian trade pact in a bordering country. If the Nazi-Soviet Pact has been signed, the resistance level of the target is decreased by -1 for each Russian trade pact in a bordering country. 28.42 DEFINITION OF “BORDERING COUNTRY”: Potential aggression targets are considered to be bordered by the countries listed below. Albania, which Italy must control before it can carry out aggression against either Greece or Yugoslavia (28.61), does not modify the resistance level of those countries. A. Ethiopia: No bordering countries. C. Greece: Bulgaria, Turkey, Yugoslavia. If Yugoslavia breaks up because of successful Italian aggression against Yugoslavia or Axis victory in a Yugoslav civil war, Greece is considered to be bordered by Serbia but not Croatia. D. Yugoslavia: Austria, Bulgaria, Greece, Hungary, Rumania. F. Austria: Czechoslovakia, Hungary, Yugoslavia. G. Czechoslovakia: Austria, Hungary, Poland, Rumania. H. Poland: Czechoslovakia, Rumania, Russia. I. Baltic States: Poland, Russia. A. One strength tile: +1. B. Two strength tile: +2. C. Three strength tile: +3. 28.52 TIMING: The random tile draw to increase the defensive strength of an aggression target is made after the Allied opposition to the Axis aggression is announced. 28.61 ITALIAN CONTROL OF ALBANIA: Italian control of Albania is required for Italian aggression against Yugoslavia and Greece. 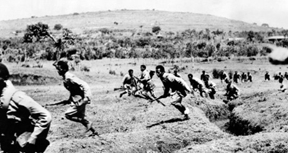 28.62 ETHIOPIA: Ethiopia always resists and must be conquered by Italy (29.32). A. If the Nazi-Soviet Pact has not been signed and a minor country containing Russian flags is the target of Axis aggression, Russia may be able to declare war on Germany in support of the minor country (32.7). B. If the Nazi-Soviet Pact has been signed, Axis aggression against minor countries containing Russian flags is prohibited.